Crispy chicken lovers from all over the world, it’s time to rejoice! These Crispy Baked Chicken Tenders with Garlic Mayo BBQ Sauce are to die for you, I tell you. Okay, so I was one of those people. You know those people, who are like chicken tenders/nuggets can never be baked AND crispy delicious. I was Team Fry through and through. I scrunched up my nose in disdain when I saw pictures of baked chicken tenders and nuggets on Pinterest, with claims of holy crispiness without a drop of oil. 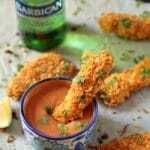 Enter these Crispy Baked Chicken Tenders with Garlic Mayo BBQ Sauce. How was it possible? Surely they must be exaggerating, I thought to myself. Of course, until I made these Crispy Baked Chicken Tenders, that is. And then dipped them into this Garlic Mayo BBQ Sauce. And thus I converted and became a part of Team Baked & Healthy. Now we can have our chicken tenders, and eat them too. Okay maybe that’s not the exact quote, but you know what I mean right? 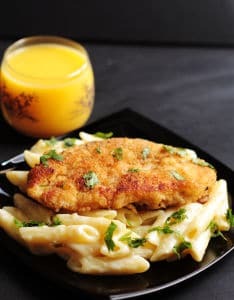 These Crispy Baked Chicken Tenders are seriously so good, you won’t be able to stop at one crunchy bite, and before you know it it…they’ll be finished. Okay, so now let me make the big reveal as to why these chicken tenders are so crispy without a drop of oil. It seems magical, but I promise there’s no complicated magic involved in making these chicken tenders. However, there is a magical ingredient, okay maybe not magical…but you know what I mean. It is probably in your kitchen pantry right now. You probably have them for quick breakfasts. I’m talking about plain cornflakes. Yes! Just plain corn flakes. Humble, plain, yet super crunchy. The ones that you have with milk early in the morning. Yup those plain old good cornflakes. And this is how these crispy baked chicken tenders were born by being coated with crunchy cornflakes. After having these chicken tenders, I don’t think I’m ever going back to Team Fry. I mean why would I, with all that oil and un-healthiness? Not that I’m know for being an extremely healthy eater, as is evidenced by these Nutella Stuffed Cookies and Golden Oreo Salted Caramel Mini Cheesecakes. Hehe. I’m just all about flavor you know, whether healthy or not. Although I do prefer to eat healthy over unhealthy. 1.) So as I said above, these chicken tenders are crispy because they are coated with cornflakes. But we don’t just use any plain old cornflakes. Well, we do. But we also add a ton of flavorful seasonings like garlic powder and paprika. 2.) It’s also important to pound the chicken breasts a bit before cutting into strips, so that they cook evenly in oven. I just cover the chicken breasts with a piece of foil, and lightly pound with a rolling pin. This is also a good exercise if you need to vent out, but that’s neither here or there. Lol. 3.) Now usually I hate setting up a dredging station for when I’m making chicken nuggets or tenders. But in this case it’s necessary for getting that crispy exterior especially since there’s no oil to help the tenders crisp up. One useful tip for dredging stations is to use one hand for the dipping in the dry ingredients and the other hand for dipping in the egg. And boy oh boy, these chicken tenders have lots of flavor and lots of crispiness going on. I guess now I’ll be one of those people claiming crispy baked chicken tenders on Pinterest. And I promise you, we are not crazy or exaggerating. Oh did I tell you? The Garlic Mayo BBQ Sauce is also super delicious, and so easy to make. Okay maybe I did tell you this above. Lol. But do try it. Although at your own risk, because it’s addictive and you’ll never be able to stop dipping the chicken tenders into the sauce. You’ve been warned. 😉 Lol. 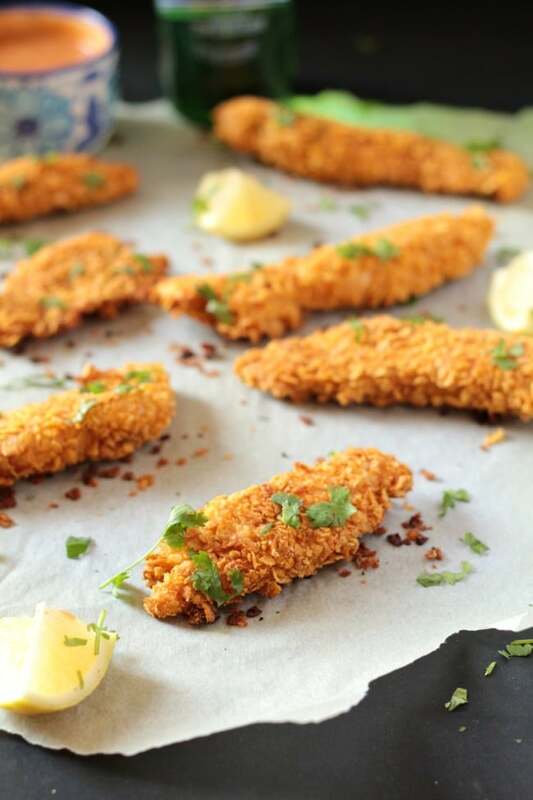 These Crispy Baked Chicken tenders are so crunchy and delicious, not to mention healthy. 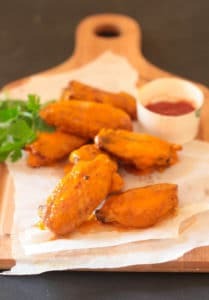 They are great to dip in a homemade garlic mayo bbq sauce, and perfect for kids and adults alike. Preheat oven to 400 F (200 C). Line a large baking sheet with parchment paper. Set aside. Lightly pound the chicken breasts so that they are flattened and cut into long strips. I covered the chicken breasts with foil and used a rolling pin to lightly pound on the chicken breasts until they were of equal thickness. Set aside. Add the cornflakes and seasonings (salt, pepper, paprika, and garlic powder) into a food processor and pulse 4-5 times until the cornflakes have broken down but there are still some big pieces. Pour into a medium sized bowl. Set up a dredging station. Place the flour into a medium large shallow bowl, and next to it set the whisked egg in a shallow bowl, and then finally the bowl which contains the crushed cornflakes. Lightly dredge each chicken strip into the flour and then dust the extra flour. Dip in the egg mixture and coat completely, and then let the excess drip off. Finally dredge in the cornflake mixture making sure it is generously coated. Place each chicken strip on the prepared baking sheet when it is coated. Once all the chicken strips are coated with the cornflake mixture and placed on the baking sheet, place the baking sheet into the preheated oven. Bake for 15-20 mins. Flip the chicken after 10 minutes to ensure even baking. Baking times may vary. To ensure chicken is cooked cut through a thick chicken tender to see if it's cooked through. Take out of oven and transfer to a serving dish. 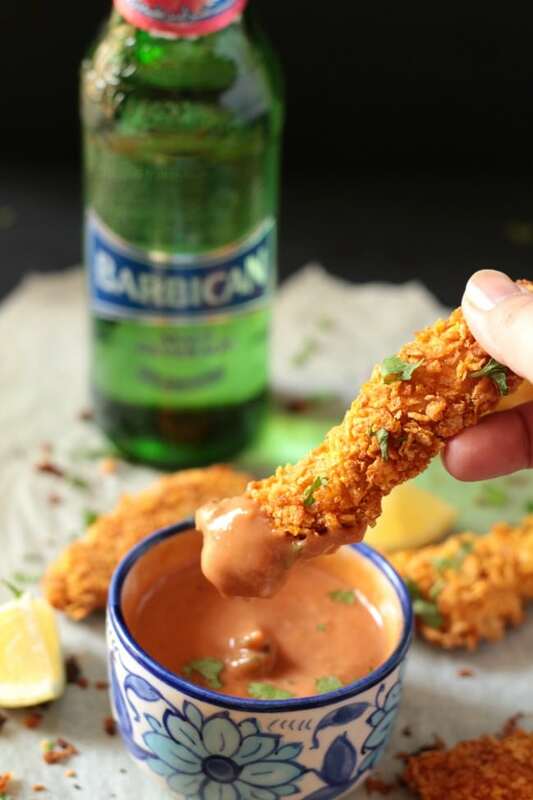 Serve the chicken tenders with the garlic mayo bbq sauce. 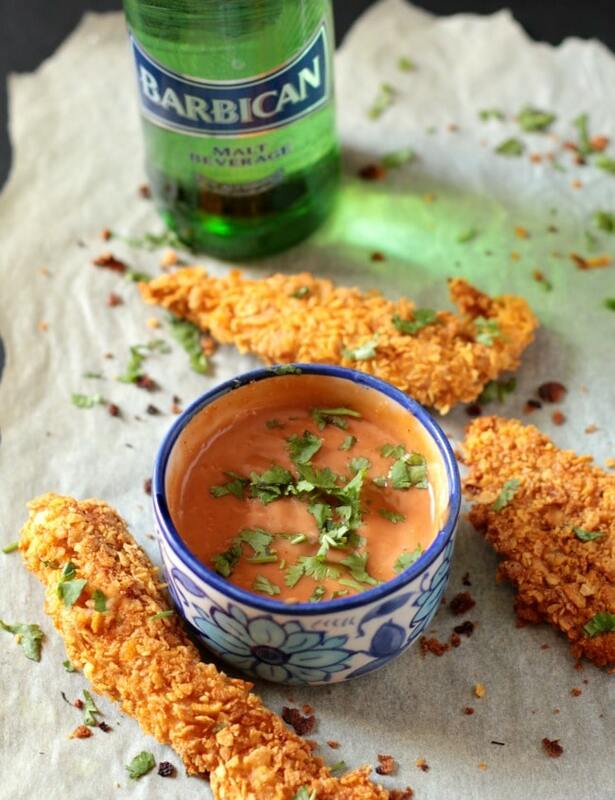 Mmmmm…these sound amazing (and so does that sauce)!!! My chicken finger-loving family would go crazy for this meal. Sounds perfect! 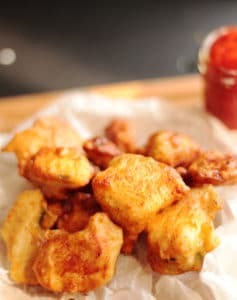 Oh my, these look so crispy and absolutely delicious, especially with that dipping sauce! I’ve got to try these soon. I am definitely on team baked and wow, these look like some of the crispiest tenders I have seen! And not complicated at all 🙂 Know my kiddos will love them and I’m going to be ALL about that delicious BBQ dipping sauce. Might have to double that so I can dip ALL the things in it! Yummed and pinned! Wow! I’m one of the non-believers, but these look absolutely amazing! Next time I’m at the grocery, I’m getting some corn flakes because these are now on my MUST TRY list!! These look absolutely delicious- so does the sauce! I will have to try these! This is my first time doing a review of food. So I saw this on BuzzFeed and I thought that later I should try them. *When that ”later” came* I was hungry and I wanted some Chicken Tenders, but in Peru there aren’t much places of eating that so I remembered this recipe. I took all the ingredients (except for Paprika) and follow the instructions. I remember that in all the pics of tenders they have cilantro so I putted on the tenders. I did the sauce, thing that I didn’t liked so much because I’m not a BBQ lover but its tasty, for me 3* of 5* I always eated the fried tenders but never baked so the flavor is different, not so much, but a little. A 4* of 5*. I never thought it could be so tasty. 100% recomendable and if sometime you don’t have idea of what to eat, try peruvian food also 100% recomendable. Greetings! Do you by any chance have the nutritional value on these? I can’t wait to try these recipes!! I cannot find the temp for the oven, how long to bake etc. Would you please tell me where to find the actual recipe not the comments about the recipe. Hi Shellie! I’m so sorry for the inconvenience, there was a technical error which made the recipe card disappear. I’ve fixed it now. Thanks for letting me know! Hope this helps! 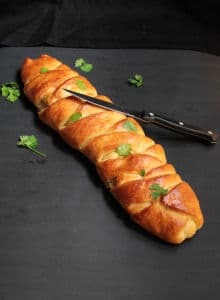 Would love to make this recipe! Could I bread these ahead of time and then put in the freezer for a day or two before baking?? WOW, these are really good,simple to make and both kid and parent approved !!! The Sauce just tops it all off !